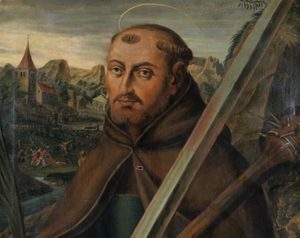 St. Fidelis of Sigmaringen was a lawyer, a religious order priest, a missionary, and a martyr for the Catholic Faith during the Counter-Reformation. Mark Rey was born in 1577 at Sigmaringen, Prussia, located in modern-day southwestern Germany. His father, Johannes, was burgomaster, the position roughly the equivalent to mayor. Mark went to the renowned University of Freiburg, where he studied philosophy and law, and was known to be an unusually devout and modest young man. He completed his studies there before teaching philosophy at the University. In 1604, he was recommended by his university and hired as a tutor and mentor for several Swabian gentlemen. Together, they spent the next six years touring and studying the various cultures of Europe. During those years, Mark was known to frequently visit hospitals, and to spend silent time in prayer in churches. He returned to Freiburg in 1611, and extended his studies to complete his doctorate in both canon and civil law. He went to Colmar, were he practiced law as an advocate. He took on the cases of many people who could not afford his services, and became known as “the poor man’s lawyer”. He grew increasingly disgusted by the widespread corruption of many in his profession, and in 1612, he made the dramatic decision to abandon his profession to become a monk. He gave half of his worldly belongings to the poor, and half to the education of seminarians. He entered the Capuchin order at Freiburg, was given the name Fidelis, meaning “the faithful one”, and was ordained a priest. He continued his theological studies under the tutelage of Father John Baptist, a renowned Polish teacher, after which he made his final vows. Father Fidelis’ assignment was as guardian of three successive monasteries: Rheinfelden, Freiburg, and Feldkirch. He earned a reputation as a powerful and persuasive preacher. By this time in the seventeenth century, the heretical Calvinist beliefs had become widespread in central Europe. Father Fidelis’ ability to refute the erroneous beliefs was effective in gaining back people who had become Calvinists. He wrote and had printed numerous pamphlets which defined the Calvinist heretical beliefs and explaining the unchanging truth of the Catholic Faith. 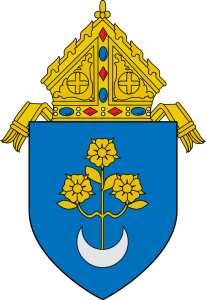 He was asked by the papal nuncio to reform the Benedictine monastery at Pfafers. In 1621, Father Fidelis was appointed by the Congregation for the Evangelization of Peoples to lead a group of nine Capuchins. This group was to work as missionaries to bring people back from Calvinism and Zwinglianism in the Grisons, a region in eastern Switzerland. Because of the poor formation of priests, who were ill-equipped to defend the Faith against these heresies, many people had abandoned their Catholic Faith. Fr. Fidelis set out with his friars carrying only the Capuchin Rule, his crucifix, his Bible and his breviary. The group arrived in December of 1621 and had tremendous success drawing people back to their Catholic Faith, preaching in several places each day. The successes that Fr. Fidelis’ group experienced was reported to the Vatican by the Bishop of Coire. This success also brought Fr. Fidelis many enraged enemies among the Calvinists, and they threatened and denounced the friars forcefully and publicly. They stirred up many people by convincing them falsely that this mission was not about religion, but more about delivering them over to the rule of Austria. Having a premonition that his life was about to be taken from him, Fr. 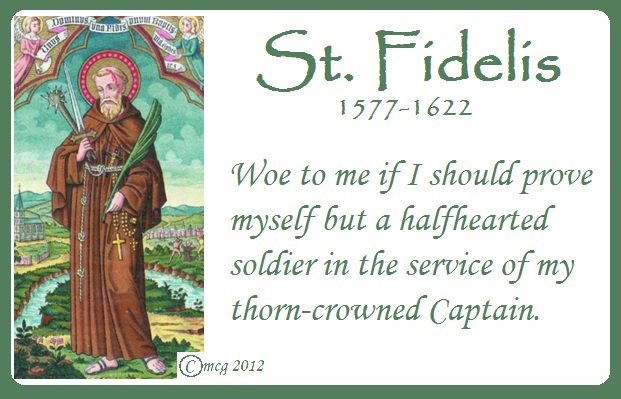 Fidelis preached with even more zeal during Lent of 1622. On April 24, he went to Confession and was preaching at the village of Grüsch. A group of Calvinist agitators entered and interrupted the assembly, with a shot being fired. Fr. Fidelis left, but returned later in the day by himself. On the way, he was accosted by a group of soldiers, with a Calvinist minister leading them. They demanded that he renounce his faith, to which he said, “I came to extirpate heresy, not to embrace it.” He was struck down with a sword, while asking God to forgive his enemies. He was just forty-four years old. A woman, hidden in the brush out of fear, was a witness to this martyrdom. 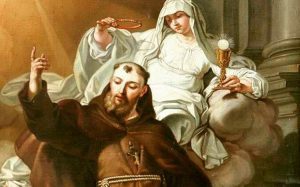 St. Fidelis had a strong premonition that he was about to lose his life, and he went forward courageously, never faltering from his mission to bring souls back to the Faith. The Calvinist minister, who had led his death squad, publicly renounced Calvinism, and became Catholic. Fidelis’ remains were separated into two reliquaries; one at the cathedral at Coire (Chur), Switzerland, the other at the Capuchin chapel at Feldkirch, Austria. He was canonized by Pope Benedict XIV in 1746. In art, he is usually depicted carrying a sword, the means of his martyrdom. His feast day is April 24.